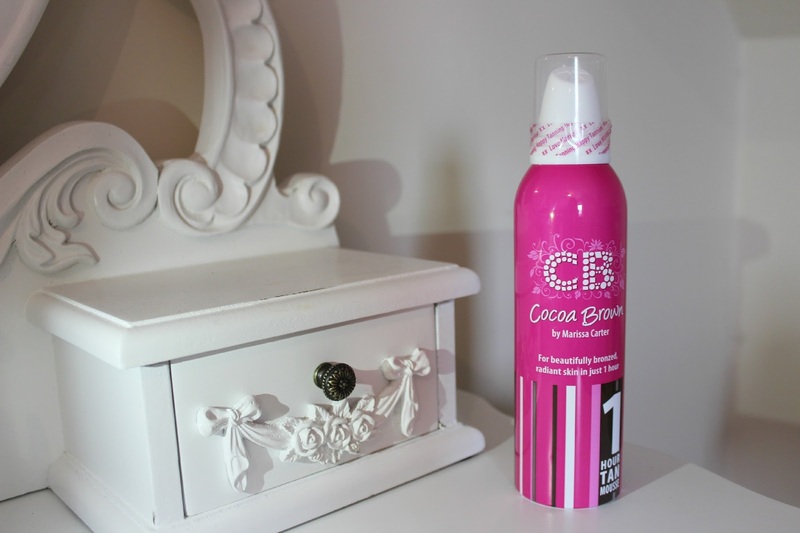 Cocoa Brown fake tan is one of the products from Marissa's range. Marissa discovered the fake tan when she was on maternity leave and has had nothing but success since the product launched. The bottle drew me in right away when I saw it in Primark quite some time ago. I believe it was around £6.00 ish. You can also purchase this fake tan in Superdrug or on their online website. When I read on the bottle that it 'lasts 5-7 days' I was sold and wanted to give it a whirl. What's great about this tan is that it develops within 1 hour... Yes! One hour. Although I left mine on for about 7/8 hours. I always put mine on before I get in bed and then remove it the following morning. Although, you could get away with wearing this one throughout the day and wash it off in the evening as it doesn't have that funky fake tan smell. Yes, you read that right NO FAKE TAN SMELL. Waheeeey! This fake tan is a mousse that has a pump dispenser. The mousse is surprisingly thick, not like any other mousse that I've tried before. To me the mousse felt what a high end fake tan should feel like if that makes sense? The consistency helped when applying the fake tan as it was less messy with hardly any splashes to the floor or on those clothes that you've left laying around. When it comes to washing the tan off in the morning I prefer to take a shower rather than taking a bath. I then rinse away any excess from the tan that's been applied and dab lightly when getting out. You must always remember to moisturise daily when wearing fake tan, it will help to pro long the tan and keep it looking neat and tidy. When I washed away this tan in particular I was shocked by the the colour it left me, I was getting compliments from everyone as it left my skin with the most natural golden tan I've ever laid eyes on (on myself that is) ha! I'm happy with this tan all round and I'll continue to re-purchase until it's off the shelves! What I've always wanted to know from my fellow fake tan lovers is... how do you get off unwanted tan? That's my biggest problem about fake tan you see my skin seems to cling and hold on to tan forever and a day, which is good at first, but not when you want the unwanted tan off. I've tried scrubs, exfoliating mitts, the back of a sponge (which felt like wire wool) and so on. I'd love to be able to get it off properly in one bath. Does anyone else have the same problem or any great tips? What's your holy grail fake tan? No fake tan smell? I have to try this!! I have tried a million types. So happy to hear this doesn't have the fake tan smell!